Grand Hyatt Manila Residences bags “Best Luxe Condo of the Year” Award - Federal Land, Inc. Grand Hyatt Manila Residences bags “Best Luxe Condo of the Year” Award - Federal Land, Inc. 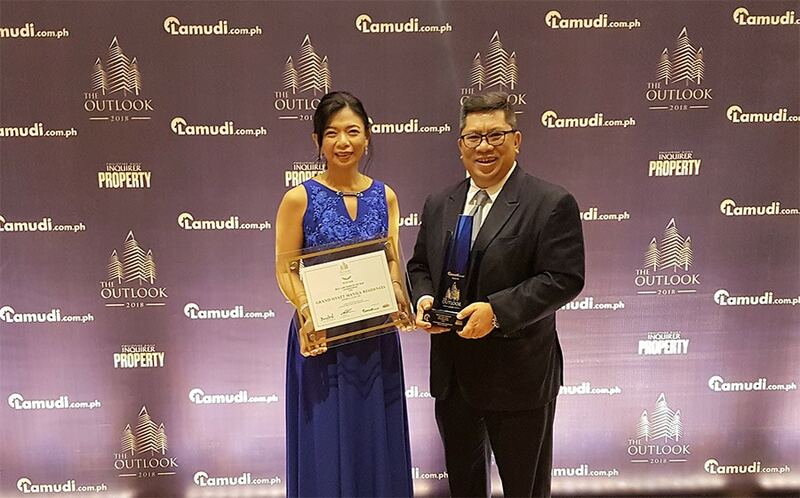 In photo “Best Luxe Condo of the Year 2018 (for Customer Service)” award for Grand Hyatt Manila Residences received by Federal Land, Inc. Executive Vice President, Catherine Ko, and Senior Vice President, John Frederick Cabato, at the recent The Outlook 2018: Philippines Buyers’ Choice Property Awards. Grand Hyatt Manila Residences won the award for “Best Luxe Condo of the Year for Customer Service” in the recently concluded The Outlook 2018 by Lamudi: Philippines Buyers’ Choice Property Awards. This is an annual event presented by top online property portal Lamudi Philippines celebrating the country’s leading industry projects and developers as selected by an esteemed panel of judges, and based on a survey participation of over 10,000 active property seekers. The “Best Luxe Condo of the Year” Award recognizes luxury condominium projects that redefine top-tier living with its upscale aesthetics, amenities and facilities. Grand Hyatt Manila Residences was recognized for delivering world-class services and design efficiencies parallel to the legendary Grand Hyatt hotel experience. Developed by Bonifacio Landmark Realty and Development Corporation, a joint venture between Federal Land Inc. and ORIX Corporation, Grand Hyatt Manila Residences is the only Grand Hyatt-branded residences in Southeast Asia. The property beckons condo buyers the opportunity to live out a hotel lifestyle marked with hotel-like conveniences as concierge, housekeeping and room services, complimented by spacious and beautifully designed living spaces. Grand Hyatt Manila Residences also provide easy and private access to Grand Hyatt Manila hotel, where more luxurious experiences and dining pleasures await. Grand Hyatt Manila Residences and Grand Hyatt Manila hotel are iconic structures in Grand Central Park, Federal Land’s 10-hectare mixed-use development in North Bonifcaio Global City, Taguig, featuring fully integrated premium residential, commercial, retail, and special interest spaces. Created by a joint venture between giants Federal Land and ORIX Corp. of Japan, Grand Hyatt Manila Residences is also one of the premier brands under Hyatt Residences. It offers world-class luxury condominium units with full access to the facilities and services of the Hyatt Hotels.